Something that is flat is horizontally level. In the state of Nebraska, the land is very flat. Snow collected on the flat roof. They placed the map flat on the table to plan their trip. In the UK, a flat is a residence within a building. Nevil shared his London flat with two friends. Ballet slippers or other dressy women’s shoes with low heels are called flats. 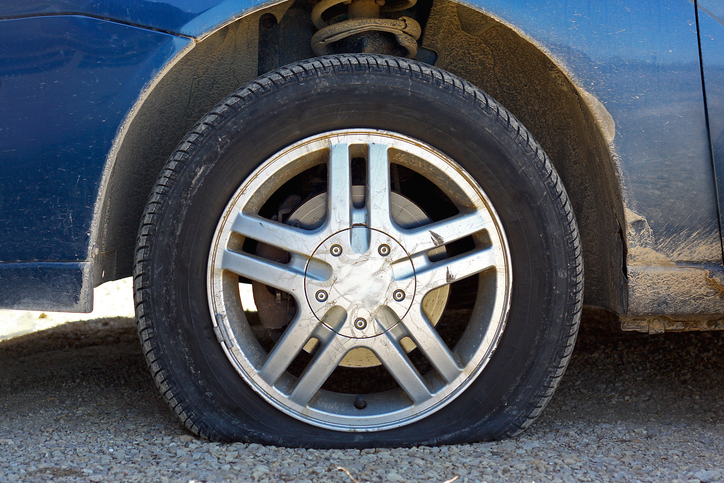 When a tire has a hole in it and the air goes out, it’s called a flat tire. In musical notation, a note that is one half step lower than a standard note is called a flat. For example, E flat is below E.
If a person has flat feet, the arch in the middle of the foot is almost level with the ground. Listen to “Flat Foot Floogie” sung by Slim Gaillard. You won’t understand some of the lyrics. Neither do we! Just enjoy the song. There are other meanings of flat.